Say Woof Petography: Daily Photo - LOOK! A Mini Me! 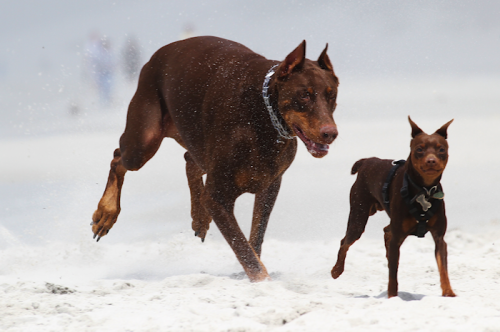 While out photographing on Carmel Beach, California, our own Red Doberman "Rocky" came across his very own "mini me". Uncanny seeing this Red Miniature Pinscher playing on the beach with my Dobie. They spent a good hour playing with each other. Do you have a Mini Me? Please leave a comment. LIKE us on FaceBook and post your Mini Me photo. For you Red Doberman Pinscher lovers or Min Pin lovers, click on the photo above to be taken to Zazzle Products.